My name is Ashley and I’m so happy you’re here. Yarn Scissors Silk was born of my love to entertain, create, bring people together and pursue my passions and hobbies. Working on a photo shoot with my mom in 1994. I’ve been an enthusiastic, energetic entrepreneur all my life. My parents indulged me when I had projects all over the house, wanted MORE sewing lessons, helped me form my “craft club” with friends, and let me have a booth at the fair to sell my handmade holiday ornaments. My mother taught me so much about life and gave me the gift of patience when I wanted to try some new craft with her. She would work with me often when she obviously had a million other things to do! She also didn’t laugh when I’d share all the ways I could monetize my craft business...when I was 11 years old! My grandmother taught me to knit and crochet. I was knitting up a storm WAY before it was the cool thing to do! We would sit at my craft table and spend hours making all sorts of things. It was a really happy time. Armed with a degree in interior design I successfully managed a well-known firm right out of college and loved working with clients and designers, but felt something was missing. Every time I’d order in a bolt of fabric for a client I wished I could run off with it and make some of my own things! I eventually left the design firm to start a business selling various handmade products and traveled to craft shows and trade shows around the east. I did a lot of networking during that time and also found work as a freelance photo stylist for a variety of books and magazines. Ashley during filming of an instructional McCall's Quilting video. As I was working at Hoffman Publishing, an opportunity came along to re-design and re-invent a magazine by the name of McCall’s Needlework and Crafts. It was a great challenge and I learned so much more about an industry I'd always loved. As the editor of McCall’s Needlework, I watched my ideas come to life. There was so much to oversee, contacts to make, shows to attend and photo sessions to set up. There were meetings to schedule, staff and designers to hire and writers and artists to collaborate with. Attending trade shows and working with advertising reps was vital to our success and I attended most of the trade and consumer shows in North America. I enjoyed meeting with designers and advertisers, seeing the trends, attending classes and press events, and promoting our magazine. I traveled extensively to meet with companies that produced or designed craft or needlework products and to do stories on designers for our column entitled “A Cottage Industry." It was a full schedule but I was lucky to have a creative and talented staff to help. I was also lucky that I had a mentor by the name of Phyllis Hoffman DePiano. Phyllis gave me the opportunity to learn and grow and with her help I was able to pursue my editorship at McCall's Needlework (You can find Phyllis' story and link to all of her amazing publications at her blog: theribboninmyjournal.com, or on her website: hoffmanmedia.com. 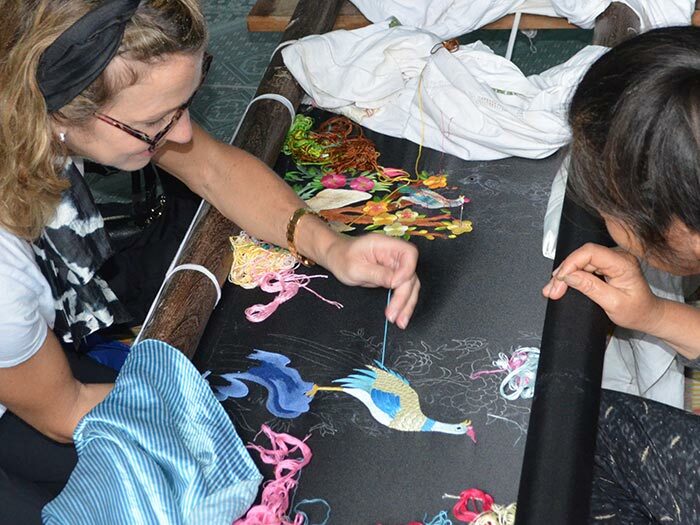 Learning new silk ribbon embroidery techniques while visiting Vietnam. Having been a Southern gal all my life, I eventually moved to the beautiful state of Colorado. Even though I left my dream job behind, I knew I’d helped create a product that so many people enjoyed. I also knew I’d come back to this business one day! For the next twenty years I worked as a freelance photo stylist for quilting and sewing magazines, did video production and on-camera work, designed my blog called Ashley Quinn Style and renovated and sold over thirty houses. I also did interior design work for clients and managed a household with two amazing and energetic boys! The time I spent raising my kids was definitely the most important work I’ve ever done. Those times were incredibly fun and busy, but I always found time to work on craft projects of all kinds. I believe our best ideas come from past experiences, travel, and a passion to grow creatively. My goal with Yarn Scissors Silk is to bring creative ideas and people together and I feel I'm at a point in my life where I can dedicate the time and attention to growing a business and a brand to spread the word. I want encourage other creators to spend time using their hands and hearts to create, entertain and pursue their hobbies and passions. Whether you're a manufacturer of craft products, a designer with ideas, or an eager reader wanting to learn in an interactive way, I hope you'll be a part of Yarn Scissors Silk!